In an eye-opening study by Future Workplace and Kronos, 87% of employers indicated that improving retention was a top priority for their organizations. Combine this with the sizeable costs of recruiting talent and/or replacing workers who leave, and you soon see why so many businesses are looking at their culture to find out what they can improve. Beyond avoiding high turnover, fostering a positive and engaging work culture also encourages higher levels of performance while reducing the risk of negative or potentially destructive behaviors. In other words, if you don’t want an employee stealing from your company or treating customers poorly — don’t give them any reason to do so. Integrity comes from the Latin “integer” meaning whole and complete. So-Young Kang, Global Leader of the World Economic Forum, goes further by emphasizing consistency, honesty and accuracy. In her definition, consistency means holding onto your values, regardless of the situation. Honesty is shown through intent, such as leading by example, and accuracy is telling the truth to the best of your ability at that moment in time. 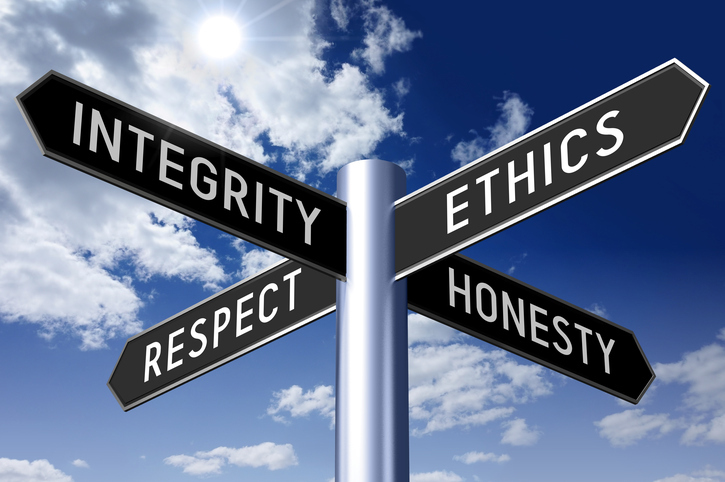 Traditionally, integrity has been seen as a personal value to be held by the employee, rather than an ethic embraced by the company as a whole. However, modern business management strongly advises that companies of all sizes take ownership of their role in shaping a culture that promotes integrity. In fact, self-awareness is the one trait that separates great leaders, managers and entrepreneurs from all the rest. 42% of employees don’t understand or even know what their company’s vision, mission or values actually are. 25% of employees feel like they can’t trust their employer. 46% of employees are looking elsewhere due to their current employer’s lack of transparency. 50% of employees feel like they’re not getting all the information and facts needed to be successful in their roles. Organizations with low engagement show 18% less productivity, 16% less profitability and 37% less job growth. Taking an active interest in treating employees as friends, and fostering social connections between employees. Offering kind, compassionate support when others are struggling. Preventing the blame game and other negative behaviors. Leading through example and inspiration. Taking the time to say, “thank you” on a regular basis. Having everyone onboard with the company’s mission in order to underscore why everything they do every single day matters. A culture of openness, fairness and transparency is a place where people feel safe. In the absence of fear, customer service, innovation and productivity all increase. If you feel like you’re valued and you belong, you’re going to do more to preserve that bond. It just makes sense in a world where, on average, we spend more time with our co-workers than family and friends. Every day, business owners struggle with difficult decisions. Choosing values above all else takes moral strength and vision. In the end, it’s up to you and how you truly define success. Software entrepreneur, Kirk Bowman, grappled with whether or not his company should return a client’s deposit check. Although his company had invested months of work into this one project and there were grey areas on both sides, Kirk thought about how the decision would be viewed by his employees, current and future customers and himself. Ultimately, he chose to return the money. Even though it was the right thing to do, it definitely wasn’t easy. However, he literally couldn’t put a price on his integrity. His company, Art of Value, is still in business and going strong. Blogmaster, content creator and inbound marketing guru at Wagepoint, Michelle enjoys simplifying complex payroll topics and generating articles with actionable advice for small businesses and startups.